This must the oldest sister on our property. She stands firm and tall, protecting, sometimes overbearing. She and her sister sibling are close, both in size and proximity. Their tops can be seen above the houses and other trees, nearly a quarter mile away. The Cedar Waxwings love to be in their branches as their canopies shade the neighboring hackberry tree where they frequently dine this time of year. 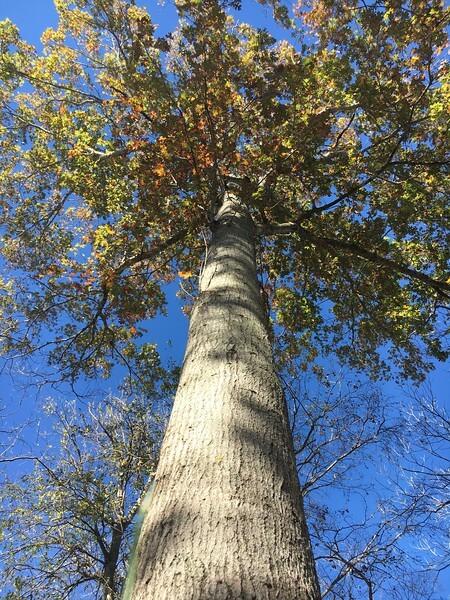 Together, the Red Oak Sisters keep regular watch on the younger oaks and pecans on the creek side. They cling to their leaves well after the others have lost theirs, losing them after the days become the shortest. Soon, the ladies will be naked like the others, waiting until spring .. forever together. For some interesting facts on the 2018 winter solstice that didn’t make it into the post, see this article in The Almanac. Me too, Courtney! A mild winter winter is always appreciated, but I know that hard freeze is lurking around the corner. On the downhill slide to spring clean-up. Whoo hoo! I never expected to hear about naked ladies on your blog. Does this mean I lose my G-rating? Not unless you also lose your G-string. .. and the world spins. It’s a nicely met expectation, is it not? Love, love, LOVE my earth and all the earthlings (like these sister trees) who share it with me. A great name to give these magnificent trees. A most enjoyable read! Glad you appreciate them, Belinda. It’s difficult not to put names to those we love most. In 2011 when the creek dried and we had a full year without rainfall (it was bad) the Sisters held on to their leaves. It was tough watching their stress play out, and I would regularly give them good long drip drinks from our well tank. Toward the end of that horrible year, we didn’t think they’d make it. To our pleasure and surprise, they did. Happy outcome, they had a fine steward! I’m so drawn to those leaves against the sky, but also that bark. I don’t know my trees very well, but I know a beautiful tree, and these are beautiful. They are beautiful. I’m sitting under them now and I feel at peace. Thank you, Pit. I certainly think they are! A truly delightful post, Shannon. 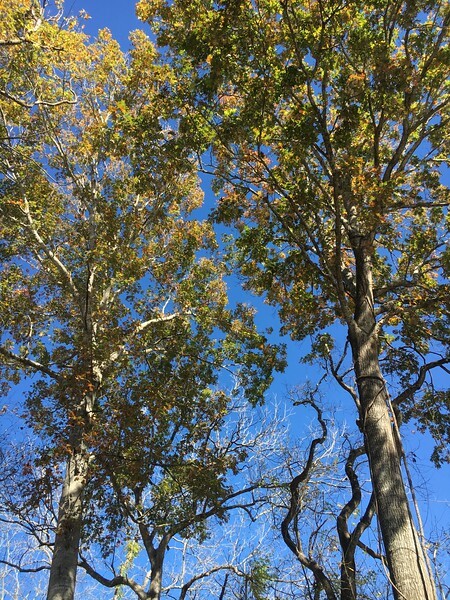 These red oaks are so tall and stately, how fortunate to have them in your presence. And filled up with one of America’s most elegant birds, the cedar waxwings — sounds like a dreamy place to be. My warmest wishes to you for a happy solstice and holidays. I love whenever you visit, Jet! I think of you often when I’m laying under the trees, you having lost so many last year. I will NEVER take trees for granted. These two girls have my soul.